Sore throats (pharyngitis) are a common complaint in primary and emergency care settings. Most of the time, pharyngitis is caused by viral infection (most commonly rhinovirus). Pediatric autoimmune neuropsychiatric disorder associated with Group A streptococci (PANDAS) *controversial! GAS pharyngitis may also include fever, chills, malaise, headache, nausea, vomiting, abdominal pain, or maculopapular rash (scarlet fever). Cough, coryza/rhinitis, and conjunctivitis are uncommon symptoms for GAS pharyngitis. However, clinically diagnosing GAS pharyngitis based on history and physical is incredibly unreliable, so patients with a convincing presentation would benefit from laboratory confirmation (i.e., throat culture, rapid antigen detection test of throat swab). The Centor and McIsaac criteria are useful for helping rule out GAS pharyngitis, but shouldn’t be used exclusively to diagnose it. The MacIsaac criteria add an extra point for patients < 14 years old (since this age group is more prone to GAS pharyngitis) and subtract a point if >45 years old. A low score on these criteria help to exclude GAS pharyngitis, but higher scores indicate a need for lab tests. The first-line treatment for GAS pharyngitis is penicillin. Other antimicrobial agents vary between different guidelines. Guidelines vary about whether empiric treatment should be considered before lab results have confirmed a diagnosis. Aalbers J et al. 2011. Predicting streptococcal pharyngitis in adults in primary care: A systematic review of the diagnostic accuracy of symptoms and signs and validation of the Centor score. BMC Medicine: 9;67. Kociolek LK, Shulman ST. 2012. Pharyngitis. In: Annals of Internal Medicine: In the Clinic (Cotton D, Taichman D, Williams S, Eds.). ITC3-1. Weber R. 2014. Pharyngitis. Primary Care Clinics in Office Practice: 41;91. Wessels MR. 2011. 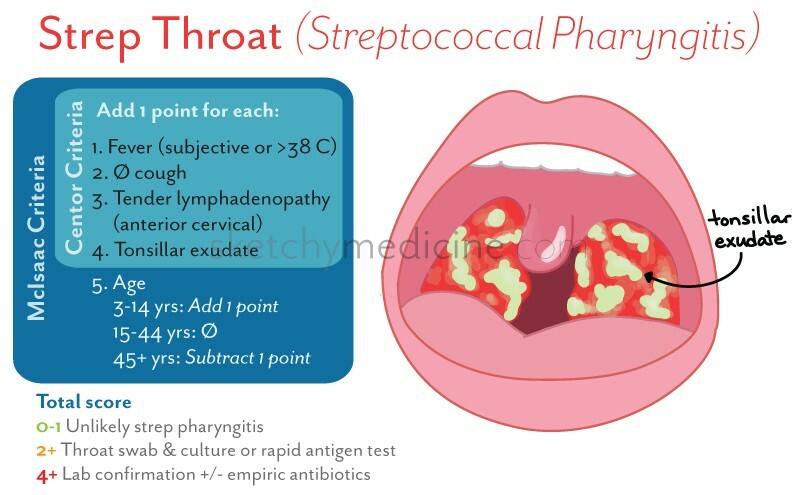 Streptococcal pharyngitis. New England Journal of Medicine; 364:648. Worrall G. 2011. Acute sore throat. Canadian Family Physician: 57;791. This entry was posted in Emergency, Internal Med, Peds, Physical Exam and tagged centor, infection, macisaac, pharyngitis, physical exam, strep by Mike. Bookmark the permalink. Treatment of Strep throat does not prevent Post-streptococcal glomerulonephritis. Good point. Wording changed to avoid confusion.